Wow! This was the first reaction when we saw Lumia 800. And the reasons for that were the gorgeous screen and a fantastic design. 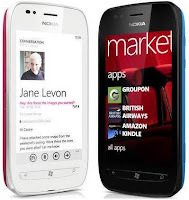 Lumia 800 is compact, sleek and very stylishly-built phone. The unibody shell is built of polycarbonate, which is soft to touch, is sturdy and feels a lot more premium than normal plastic. On the top, there are slots for micro USB, micro SIM card tray and 3.5mm jack. As it has been the case with most unibody phones, users can not access battery and there is no provision to add micro SD card. The front is all curved glass, with three capacitive touch buttons. The buttons - back, home, and search - are standard Windows Phone 7 affair. On the right side, there are buttons for volume control, on/off and camera shutter. All of them have chrome finish to them. The AMOLED screen is vibrant and bright. Combined with the modern design, this goes very well with the Metro UI of Windows Phone 7.5 aka Mango. Lumia 800 has an 8 megapixel camera. Inside the demo room lighting conditions were not very appropriate and hence we could not test out camera properly - it's hands on, right? But the pictures we took looked good and had appropriate colours. The interface was the standard Windows Phone affair. That means it was fast and fluid. In addition to Mango apps, Lumia 800 will come with Nokia Drive - a navigation app - and Nokia Music. Of these Drive, with its turn-by-turn voice navigation feature and support for a large number of India cities, has potential to be the killer feature of Nokia's Windows Phones. Overall, our first experience with Lumia was pleasant. Of course, once we explore it in detail we will be able to say more on it. Also, whether it will appeal to consumers or not will depend on its price, something that Nokia refused to reveal today. Lumia 800 is powered by a single-core 1.4Ghz CPU. It has Adreno 205 GPU, 512MB RAM, a 3.7-inch screen (480 x 800 pixels), a 8MP rear camera with dual-LED flash, and 16GB storage. It weighs 142 grams. This device from Nokia is aimed at mid-segment of smartphone market. And as a result lacks the chutzpah and elegance of its older sibling. Lumia 710 is more average looking phone with a pretty thick design and plasticky buttons. Fortunately, the material on the back cover - yes, unlike Lumia 800, it has one - is soft rubber which feels nice to touch. While Lumia 710 felt like a decent mid-range phone, we did not like the touchscreen at all. Not only it looked dull - especially after we had feasted our eyes on the gorgeous screen of Lumia 800 - but also felt a little slow as far as touch response is concerned. Of course, it was a demo piece and things may turn out to be different with the actual retail units. The camera on Lumia 710 can shoot 5 megapixels pictures. We snapped a couple of pictures in the demo room. They were decent but nothing exceptional. Due to low light there was noticeable grain on the photos. On the software side, Lumia 710 runs the same Mango that other Windows phones sport. Performance is good and there is no lag. 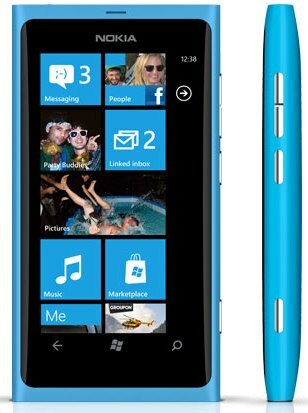 Similar to how it is with Lumia 800, this phone too will come with Nokia Drive and Music. Unlike Lumia 800 that has good looks going for it, we feel that Lumia 710 will have a harder time against the competition. Unless Nokia prices the device very aggressively. Lumia 710 is powered by a single-core 1.4Ghz CPU. It has 512MB RAM, Adreno 205 GPU, 8GB storage, 5MP camera with LED flash and 3.7-inch TFT screen (480 x 800 pixels).